UPDATE: The market location issue has been solved and it is now operating at 234 Matlage Way, Sugar Land, TX 77478. Last week, we received some shocking news. The Farmer's Market at Imperial (our home for the past 4 years) will be closing after November 18. Yes, it is supposed to reopen at some point, but there is no timeline set (could be months, could be years). To say we are sad to see it go is an understatement. One of our early markets from our first year of business. In July of 2013, Fort Bend Coffee Roasters ran their first booth at the Sugar Land market. We were a bit crazy to try to sell coffee in the middle of a Texas Summer, but somehow it caught on. The good people of Sugar Land loved our coffee and we grew bit by bit. I still remember those first weeks when we roasted our coffee at the market and sold 4 varieties (including Marty's Blend!). I can say with absolute certainty, that we would not be where we are today without this market. It was our first proof of concept; with low cost of entry, and easy access to people who cared about local food and were willing to pay more for something better. But, our story is one of growth and success. After a year of Saturday mornings, we took the plunge and opened a commercial roastery. But the market was still the majority of our revenue in our second year. And it was still the place we met most of our new wholesale customers. Our little outdoor coffee bar was impressive enough to land us new accounts. Our business was still, at its core, a farmer's market (with a few coffee shops and restaurants for support). So, roughly 200 markets later, we have two more markets to go before the end. This Saturday (11/11), I've got my (recently hired) employee Jorge running the booth. Then, on the final market (11/18) my wife and I will run the booth together, just like we did most Saturdays in our first year. We want to take this time to reflect and to say thank you from the bottom of our hearts for the support you have given us these past 4 years. You have made Fort Bend Coffee Roasters a reality! So on the 18th, we will have some bags for sale, but the cups of coffee will be free. If you have been one our regulars, I hope you can make it as we want to thank you in person. Ok, so enough of the sentimentality, where will you be getting your coffee after the market ends? I'm glad you asked. First, check out our find our coffee page for a complete list. You can order online and have it shipped to your door. Shipping prices are best for 2 bags at a time. You can also order online and have the coffee delivered to one of our coffee shop accounts (no shipping fee). Currently this is available for First Cup Cafe in Fulshear and Blockhouse Coffee and Kitchen in Richmond. Also, we are talking with a soon-to-open restaurant in Sugar Land Town Center and along with serving our coffee, they may also carry our retail bags. Keep on eye on our website for this. That's the bags, but what about the pour-over bar. That's where we get to slightly more exciting news. We are very close to signing a lease on a new space for our roastery that will also include a coffee bar! No, it won't be in Sugar Land (sorry!) but it will feature our coffee done the way we want, and you will be able to see the roasting process too. I promise more news on this once we get closer. In the meantime, visit one of the coffee shops or restaurants that we supply. Finally, we are sad to see the market go, but timing is not too bad for us. This would have been devastating for our business even a year ago. Many of my fellow vendors don't have large revenue streams outside of their market business. Do what you can to support them as they find other avenues to sell their goods. Ok, so that's a bit over-dramatic but here in the coffee world we are watching the maturation of 3rd wave coffee. The news hit today that Blue Bottle Coffee was purchased by Nestle. Or, at least they now own 68% of the company. They paid a cool $500 million for this privilege. Quite impressive for a niche brand that currently has 50 stores. Founder James Freeman is still at the helm and the company claims that nothing will change in their focus or quality. Don't expect to see Blue Bottle branded Nespresso capsules anytime soon. The new capital just gives them a chance to grow more aggressively and invest in coffee technology. Time will tell. They are not the only ones, 2015 the parent company of Peet's Coffee and Tea purchased Stumptown outright, and got a majority stake in Intelligentsia. What we are witnessing is big companies realizing the awesome growth potential in the third-wave coffee market. They are buying up the biggest and most established players in the market and planning aggressive growth strategies. Starbucks is pulling its weight too with their Reserve Roastery cafes. Before I talk about the challenges, I want to point out the positives in this. First, this is the ultimate proof of concept for the 3rd wave coffee industry. This style of coffee is here to stay and it is poised for pretty dramatic growth. I envision a time in the near future when Starbucks (while it still may remain the most ubiquitous) will not be the only national chain available for coffee in most markets. Second, Blue Bottle, Stumptown, and Intelligentsia are all (currently) producing amazing coffee. As they expand, they will teach more people what great coffee is, which will make the education process easier for us little guys. My customers who are transplants from major coffee cities like Seattle and Portland are often great to work with. A roaster or coffeeshop has already done the work of introducing them to third-wave coffee, teaching them about the product, and helping them find what they like. They can usually find something similar to what they enjoyed at home from our lineup without much help from us. Third, these large third-wave companies have been pioneers in helping farmers and cooperatives get better prices for their coffee (at a time when it was really hard to do!). I don't see their general vision for coffee quality changing, so this will mean even more demand for high quality coffees that give livable wages to coffee farmers. On the other hand, this does mean more competition for the thousands of small coffee roasters and independent coffee shops across the nation. When we are competing against grocery store coffee or Starbucks, we can win on quality pretty easily. But these large third-wave shops have access to some of the very best coffees in the world and have the buying power to ensure that no one else can get a hold of them. Our coffee will be a of equal quality and flavor (though it might be fresher depending on how well they maintain their supply chain). We will have to find other ways to set ourselves apart, such as local pride, customer service, and individual attention that a larger company cannot offer. I personally, am happy to be focused on the suburbs of Houston. While I can definitely see Blue Bottle or Stumptown opening a cafe in Houston in the next 5 years, I don't think they are setting their sites on Richmond or Fulshear yet. It is fun to be a part of an industry that, on one hand is 600+ years old, but on the other hand is on the cusp of a massive expansion of the new style of coffee. So, you are probably going to see a lot more photos like this. I am super excited about a bunch of white flowers. 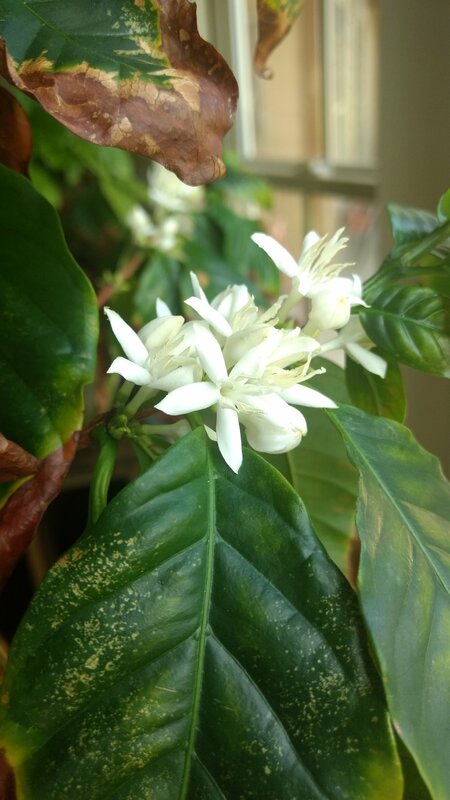 This is a coffee tree (Arabica) and this is the first year it has flowered. If we are lucky, we will get some harvestable coffee cherries and I will be able to harvest, process and roast a very local cup of coffee. It's a coffee tree, but it's a lot more than that. You hear a lot about my life (Bryan) and my exploits in this company, but in fact Fort Bend Coffee Roasters is a partnership. My partner is none other than my wife, Abby. She has largely worked in the background, supporting me and making sure we present a coherent and artistic image. She also keeps me in line when I come up with ideas that are a little too crazy. I am the visionary, she is the realist. And its a good thing we have each other. Abby has sacrificed much for this company. She has spent countless Saturdays with our kids so that I could bring coffee to the Sugar Land farmers market. She picked up the slack in the early years when I maintained a full time job along with the roasting business. We have done without while we have waited for our business income to take off. And she has stayed home with our kids and done whatever odd jobs were needed so that she could be with our kids before they reached school age. Along the way, Abby has gotten the opportunity to sell coffee with me, learn how to make an awesome espresso, get a crash course in marketing, finance, customer service, branding, and all the other free lessons this business has given us. She can talk with the best of them about roasting, brewing, coffee growing, harvesting, processing, and the business in general. Abby's favorite origin is Guatemala, and I make sure we always have at least one lot from that origin in our lineup. Abby has worked in the background while I have gotten all the glory as the head roaster. I want to let you in on a little dream we have for our future. When Abby and I were engaged and planning our future, we had this rather frivolous dream of opening a coffee shop together when we retired. As the roasting business grows and becomes more self sufficient, we hope to expand with a coffee shop attached to our roastery. 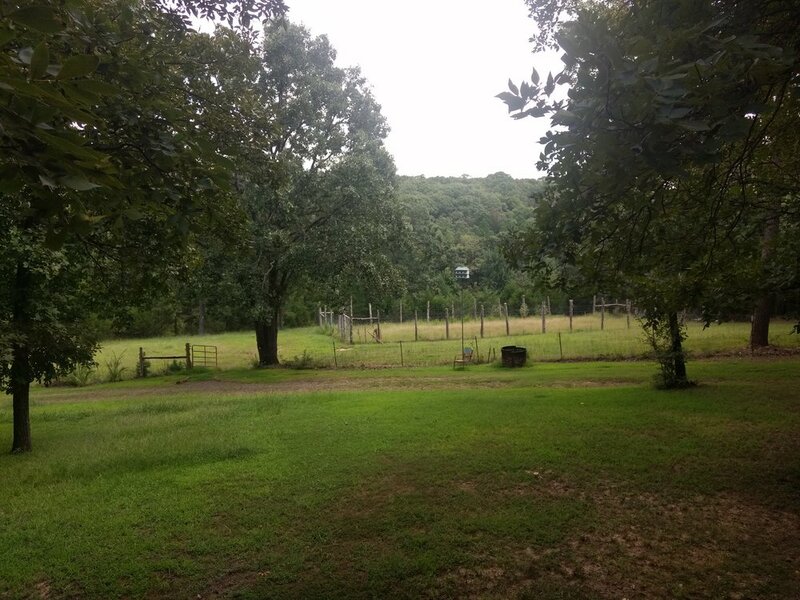 That will involve a move to a location that is not in the middle of nowhere, and a lot of capital. I'll keep my focus on the roasting side. But, our plan is for Abby to take center stage in the coffee shop; training and guiding our baristas in producing the best coffee we know how to make. We love all of our wholesale partners, but we still want the chance to share our own voice in coffee. I've been doing this long enough to make no promises on timing, but we hope to get this into motion once our youngest is in kindergarten (about 2 years from now). If this sounds like something you want to see happen, just keep buying our coffee and singing our praises to your friends and family. So, about that coffee tree, you are probably wondering why it is so important to me. Abby gave me a tiny coffee seedling as a gift for our second anniversary, before I was even a home coffee roaster. I kept it in my office in Colorado and it moved with us to Texas. All along, I have seen it as a symbol of our relationship. Hence, I have tried really hard to keep it alive! In June, Abby and I will celebrate our 9th anniversary. And just like our love, the tree has grown (imperfectly, mind you) and has become more beautiful. I hope to see this simple coffee tree continue to grow and flourish and, in a few years, sit in a sunny window in our new coffee shop!